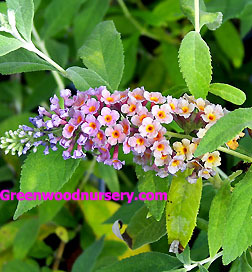 Buddleia Bicolor Butterfly Bush is an amazing flowering shrub to have in your butterfly garden. The very first butterfly bush variety to produce two different colors within the same bloom; a rich lavender combined with buttery yellow. Buddleja x weyeriana 'Bicolor' is an easy to grow butterfly flowering shrub. It's extremely fragrant and will attract tons of butterflies to your perennial border or patio garden area. The butterfly bush blooms all summer long with large blooms measuring 5 to 6 inches with some even growing out to a full 10 inches by the end of the growing season with an amazing fragrance. The BiColor butterfly bush plants mature in the 5 to 6 feet height and by cutting back each winter more branching and more blooms will appear each and every subsequent season. The Bi-Color grows easily in any sunny, well drained area, yet also shows a drought tolerance and indifference to extreme heat and humidity. Buddleias or butterfly bushes can be planted in full to partial sun with 4 to 8 foot spacing. They generally look their best in groupings of 3 to 5 plants. Alkaline soil (pH 6.5 to 7.0) is usually preferred. Fertilize in spring/summer with a slow release fertilizer. Deadheading them will keep the plants blooming longer during the season. These beautiful flowering shrubs can be cut back nearly to the ground in winter. As they age, you may find yourself with more of a shrub that can be merely pruned in winter. One of the most common problems that they experience is spider mites, which can be handled with regular (monthly) spraying of a miticide. Check for spider mites by taking a piece of plain white paper and placing it under several of the branches/leaves, tap the higher branches. If you see tiny red/rust colored spots on the paper, the plant is infected with the spider mites. This item cannot ship into Oregon. Wow! Can't believe how much these grew in year one. I spaced these guys apart 5-6 ft as directed and thought that I was crazy - the little plants looked so forlorn so far apart. Fast forward six months...these guys are now 3ft wide by 4ft tall...in one season! No maintenance by us besides a little water in the first few weeks. Grown in clay soil in Atlanta, GA. So impressed by these plants!